You can kill yourself running. Literally. Yes, I was never aware of the fact that there can be casualties during a marathon. I thought running is nothing more than… running. You keep your pace for as long for as you can and, if you are lucky, you make it to the finish line. If you train hard you get rewarded. If it’s too much or you have a bad day, or your body does not want or simply cannot cooperate, you step aside and let it be. But two people died on Sunday - cardiac arrest. Would one know when to stop? When to scale it down? Can one fail to read the signs one’s body sends? Does one’s body send any signs at all pointing to such a catastrophic turn? I am clueless. It is such a nice landscape, racing with and along the Danube, under green trees slightly turning yellow, vineyards with heavy grapes hanging one next to another… And you’ve got nothing better to do than to die! At 10 AM the weather looked good (meaning - cloudy and a bit cool: perfect for running). 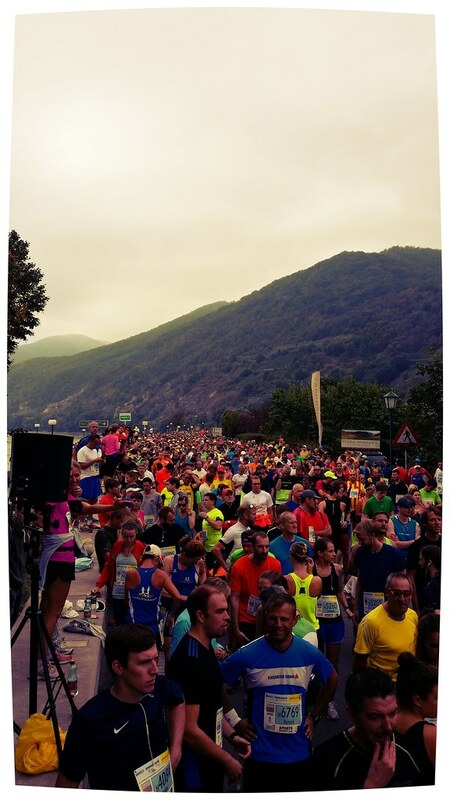 Over ten thousand people waiting behind the start line. A thicket of bodies, moving forward, loosening up bit by bit. Confidence. Strength. After two km, the clouds suddenly disappeared leaving behind a bright yellow, late summer sun. A lazy wind started rustling through the trees, bursting gently after a bent in the road, disappearing completely after another, on and on. I was pushing forward, gaining ground, despite my intention to start slowly and add speed in small increments. “It only goes downhill”, I thought. “I only need to keep moving my feet”, I thought. After around ten km I realized I will have no resources left to pull up a final sprint and I will be lucky if I could keep the pace I have now. Sun. Heat. I kept crunching small salt crystals and washing them down with water at every second station. In Dürnstein we ran through a tunnel. I enjoyed the coolness inside it but I was suddenly startled at the lack of colors around me. All runners left and right, the walls of the tunnel, the pavement, everything was black and white. To my right there was a girl in (what must have been) a red T-shirt but now it only had a faint pink hue. Almost panic-struck I glanced at my own red T-shirt and realized it did not look better. “What happened?”, I kept thinking. “Where did all the colors go?” I looked out towards the end of the tunnel and I calmed down when I saw the dark green of the trees and bushes on the side of the road. “Nothing happened”, I kept repeating. “This is certainly a sort of optical illusion, brought about by the sudden change of light, or something to that effect. Just keep running and do not think too much!” At the end of the tunnel - an explosion of colors reassured me that everything was still OK. Run! After a while I got hungry but I knew I could not afford to stop. I thought about eating from the muesli bar I had with me. But however hard I tried, I could not get the damn thing open. Sweaty fingers (some of them continuously involved in carrying the tiny salt bag which I managed to slash open a few km ago and whose content I almost spilled on the ground) repeatedly hindered my intentions. I tried tearing it with my teeth and I finally got to it. I took a bite. I tried chewing it… and regretted it almost instantly. My mouth felt even more dry… as if I was eating… feathers or god knows what. I needed water but did not have any. And chewing while running… Not a good idea… So, I tucked the rest of the bar back in my pocket and kept running hoping I’ll get to some fluids soon. Km 17 - STOP. Eat. Drink water. Powerade. Go! Krems. I thought I could already see the finish line: a few inflatable tube arches. And I was happy but I knew I have to struggle through around three km more. Not much power left. Sprinting was out of the question. Keeping a running pace was becoming questionable. “Just a few steps, I could just take a few steps… just to catch my breath… half a minute or so…” “No! Keep running! Do not stop!” I could not see much around me. I remember passing a runner who was just about to lose her balance and fall, but who caught herself quickly and (I hope) managed to either get some rest or to keep going. I watched the bystanders looking in my direction in order to find out if she needed any help and I thought I would turn around if I saw any sign of panic on their faces. I remember thinking there were not many people rooting for us. And then, I remember trying to push it a little bit - the black arch was just before me. That’s it, I thought. I finished. But I did not. There was another arch waiting for me - a red one. Damn it! Well, what’s a few hundred meters more! Go for it! But that was not it, either. A metal scaffolding with two huge digital displays was still in front of me. And that was the end. Just a few meters more. And done! 21 km in under two hours. Not bad. It could have been better, of course, but I was happy to have crossed the finish line at all. Tired. Energy level well below zero… My brain thought it were a good idea to show me how the world would look like if it were painted yellow… Oh… That means there was too little blood for my brain to stage anything at all… Head down, breath, breath, pump some color back into the world. Eat something! Drink something! Crunch more salt! The rest of the day went surprisingly well. No headache. No muscular strain. No nausea. Just hunger and thirst. I am curious how next year will be like.